It’s been a while since I have posted a sweet recipe. That’s a good thing. That means I’m not making dessert as often as I was earlier in the year. My mom would occasionally disappear into the kitchen and come into the family room with a too hot to touch platter of apple fritters. Sometimes we’d wonder where she had gone and would catch her standing over a pot of oil frying them. I don’t know which was more exciting, the surprise or the anticipation. It was her thing. She wasn’t June Cleaver, by any means, but she liked to spoil my dad every once in a while with a hot cup of coffee and her fritters or sometimes a slice of German plum kuchen. Like my grandma’s fried chicken, mashed potatoes, and milk gravy, I can’t make things that taste just like my mom’s. 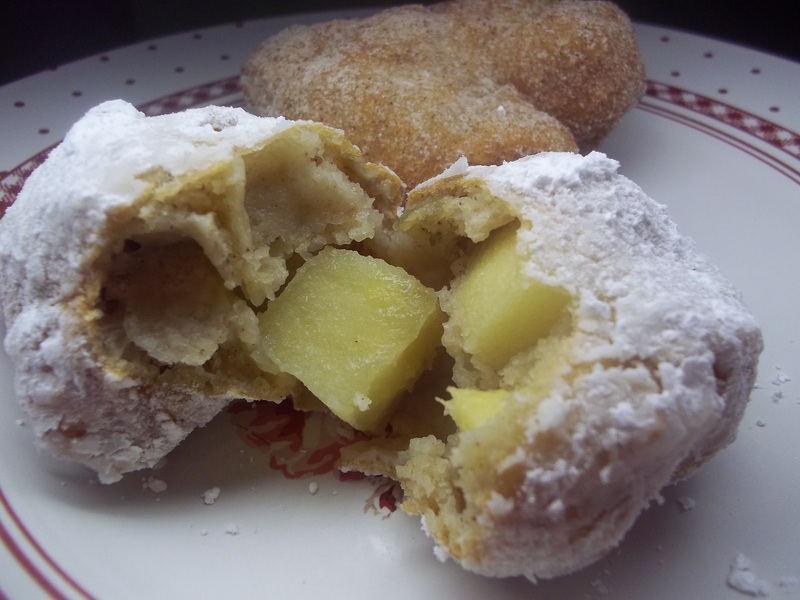 Apple fritters are one them. They are good, melt in your mouth good, rolled in powdered or cinnamon sugar, but they never taste like Mom’s. If she had a recipe for them I’d ask for a copy but, just like when she made her plum or apfel kuchen, red cabbage or roladen, I don’t think she ever used one. This was my latest attempt. I tried to make them like a little diner in our town makes theirs, giving up almost completely after several failed attempts at duplicating my mother’s, and ended up flopping at that too. They were good, just not what I was going for. I did roll half in confectioner’s sugar and half in cinnamon sugar like Mom does rather than icing them with doughnut glaze as they do at my favorite little diner. They took forever to fry, about five minutes on each side. That’s a lot of hot oil babysitting for two dozen fritters. No wonder we went looking for Mom, sometimes, to see what she was up to. 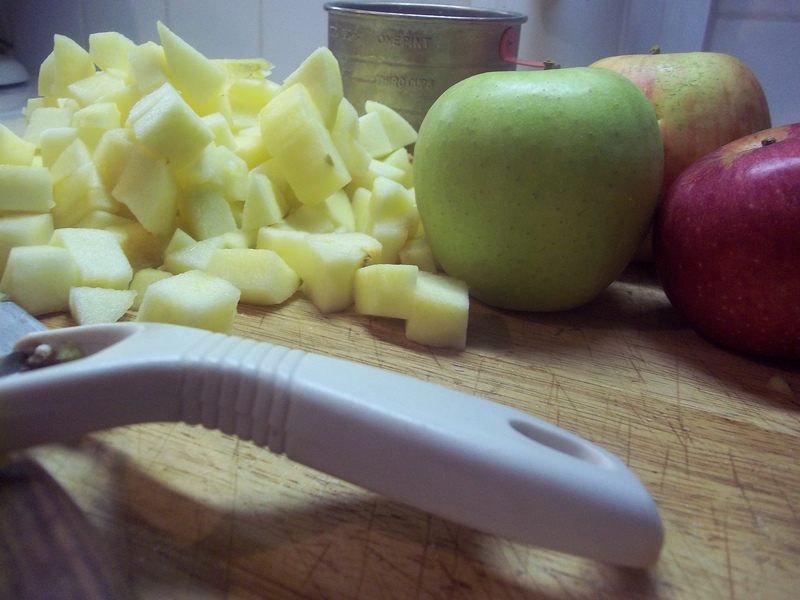 4 c. apples, peeled, cored, large dice. I used Gala, Rome, and Granny Smith. 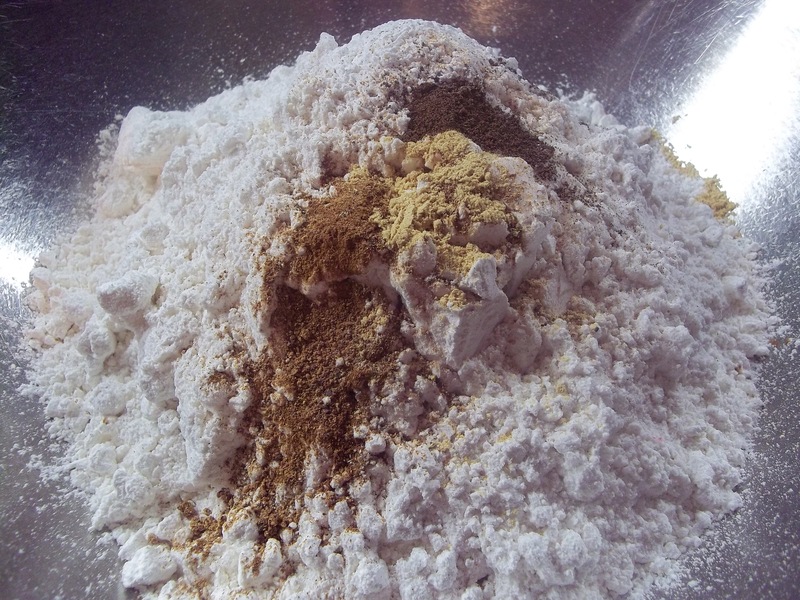 Sift together the flour, baking soda, baking powder, salt, sugar, cinnamon, nutmeg, allspice, and ginger. Toss in the apples, turning to coat well. Beat the eggs in a separate bowl. 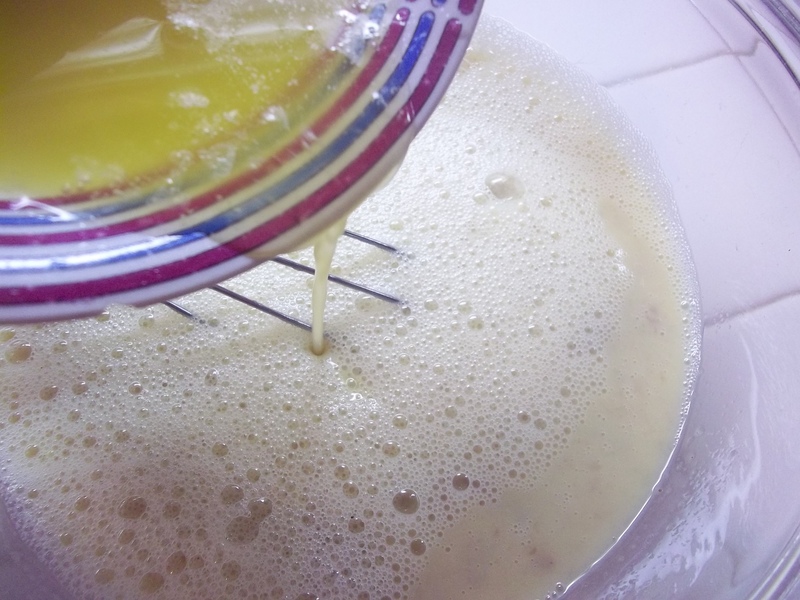 Whisk in milk and applesauce. Melt the butter. 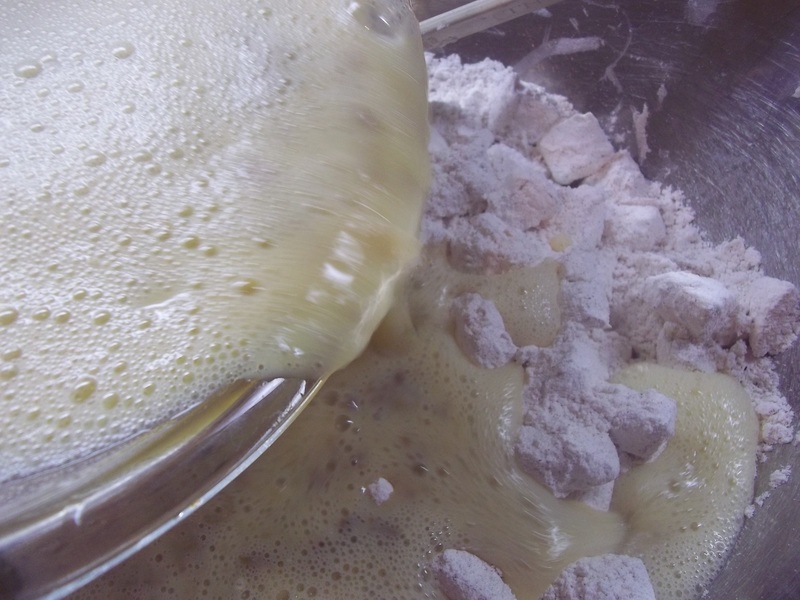 Add to the mixture while whisking vigorously to incorporate. 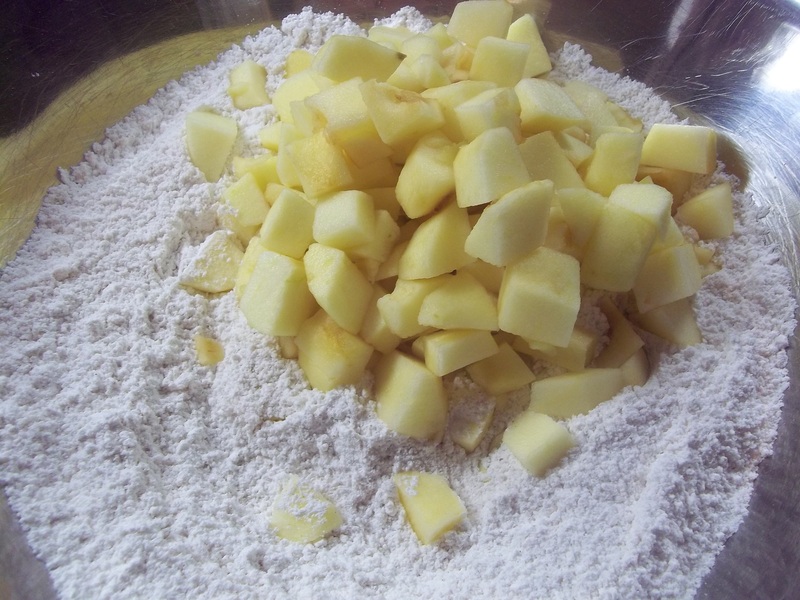 Add all at once to the apples and dry ingredients. Fold until the dry ingredients are moistened. 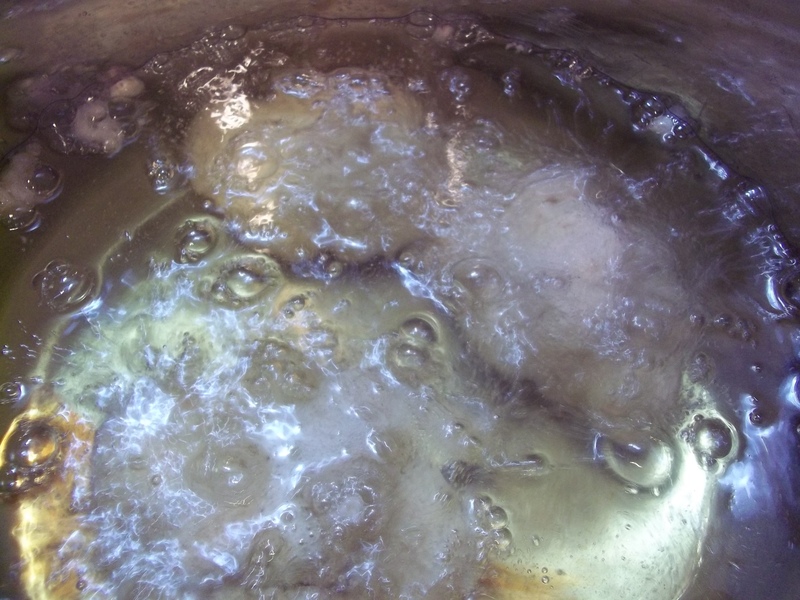 Test to see if the oil is hot enough to fry the fritters by dribbling a few drops of batter into it. If they immediately rise to the top and bubble, it is ready. Do not heat it to the smoke point. I never take the temperature of my frying oil so I cannot give an accurate one as a guide. 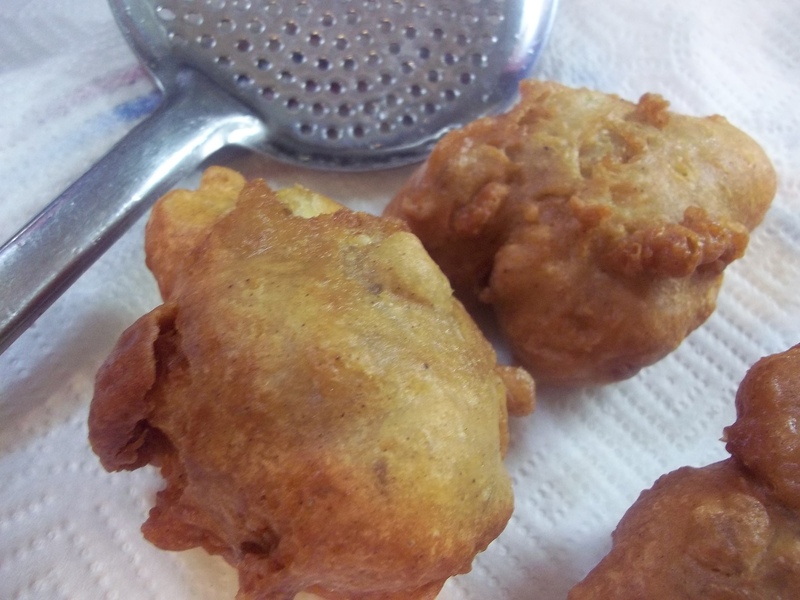 Drop approximately two ounces of batter into the oil to make each fritter. I can easily fry three at a time in a 9″ wide saucepan. 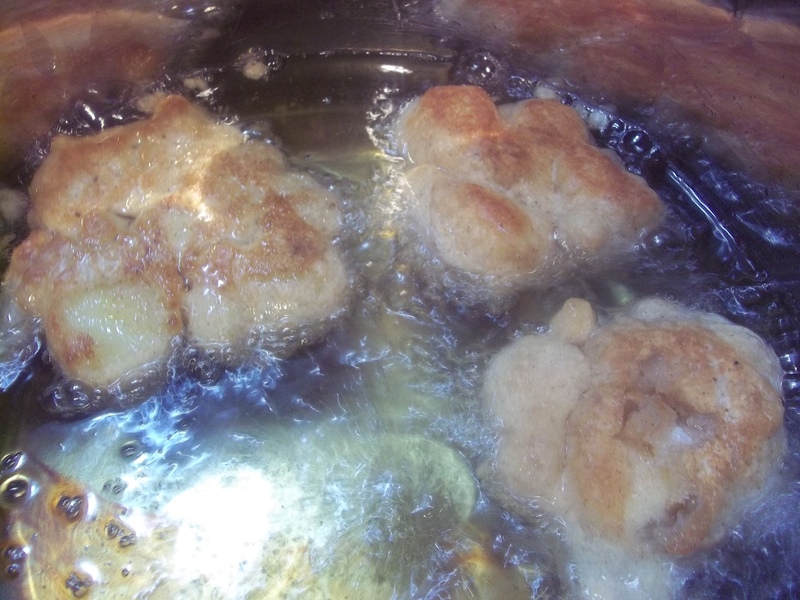 It takes around five minutes on each side, total frying time, to cook the fritters through, but I turn them twice to make sure they cook evenly. 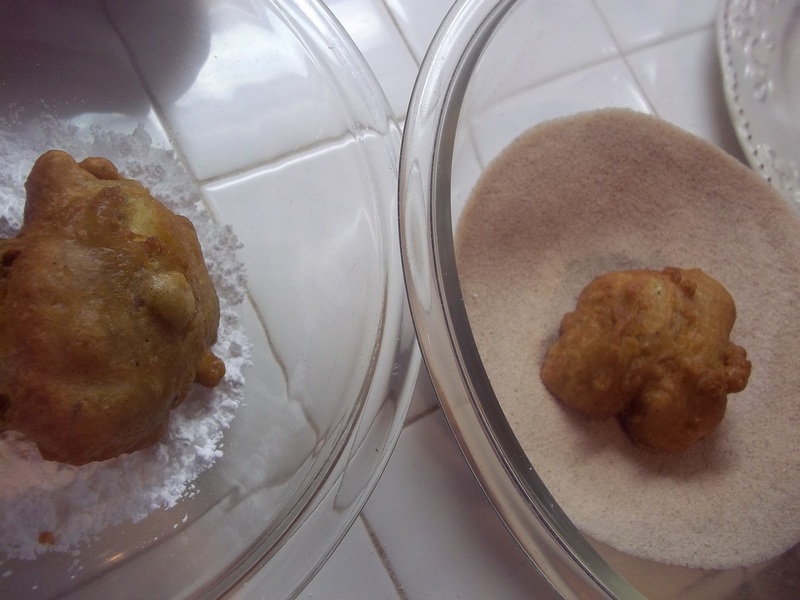 Years ago, when I first started making them, I would find that they were golden brown on the outside and the very centers would still be batter. I find that turning them twice and cooking them a little darker than I think I should, does the trick of making a fluffy, crispy fritter. 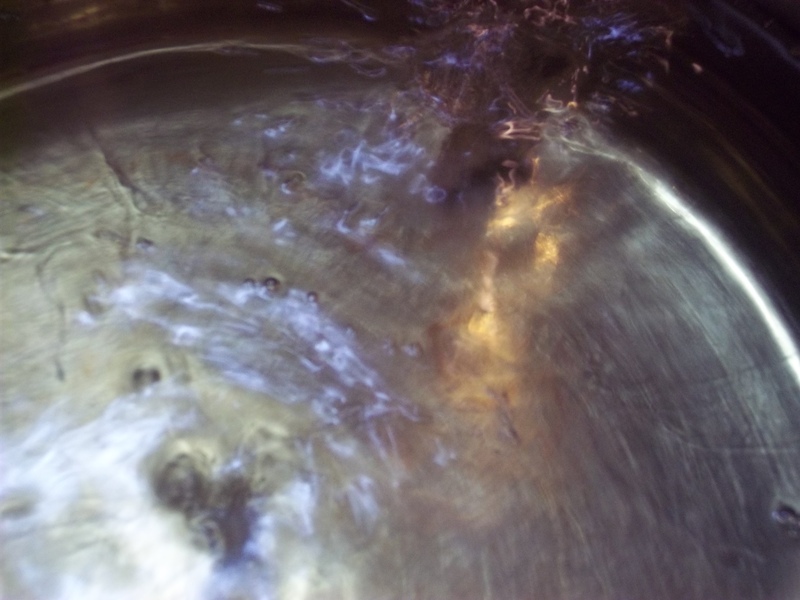 Drain on absorbent paper for a few minutes before rolling in one or the other of the sugars. 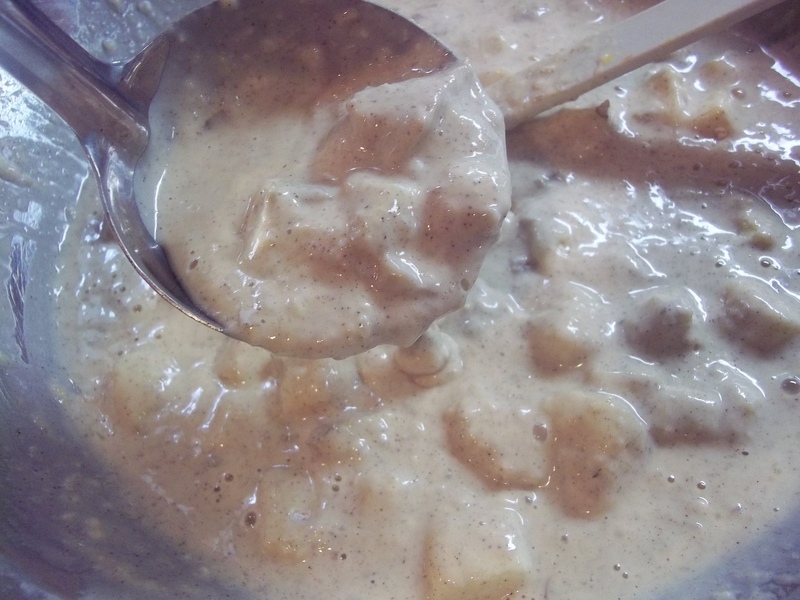 By the time I add the new batch of batter to the oil, the last batch is ready for rolling. Serve hot with coffee, like Mom used to do. Um…”It’s been a while since I’ve posted a sweet recipe”…duh…pumpkin pie was my last post. Head’s in the clouds these days. Must come down. This will be my next attempt. 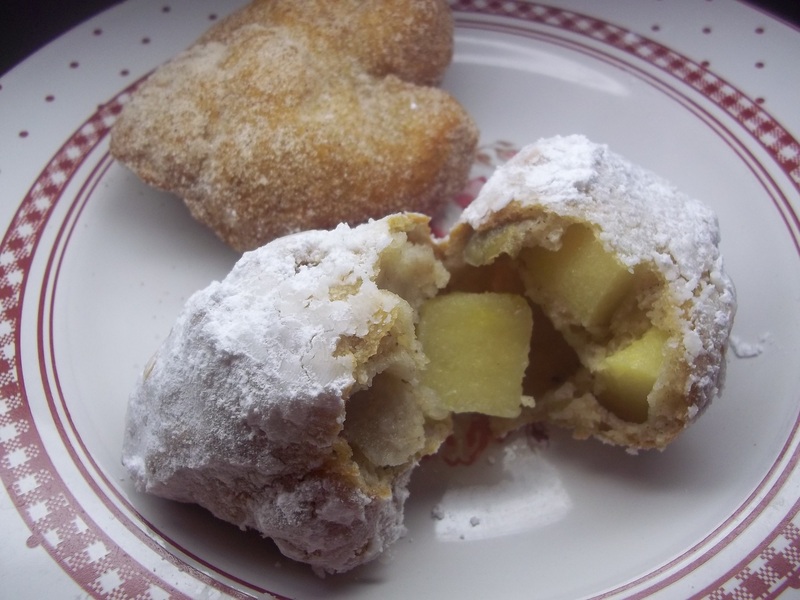 I love apple fritters. I don’t have time to make them before the end of the Hungry Games, but my mom and dad will be here for Easter and I think we will make them then!! Yummy, can’t wait. I think I will try the new Pinata Apple we found the other day at the store….they are yummy! 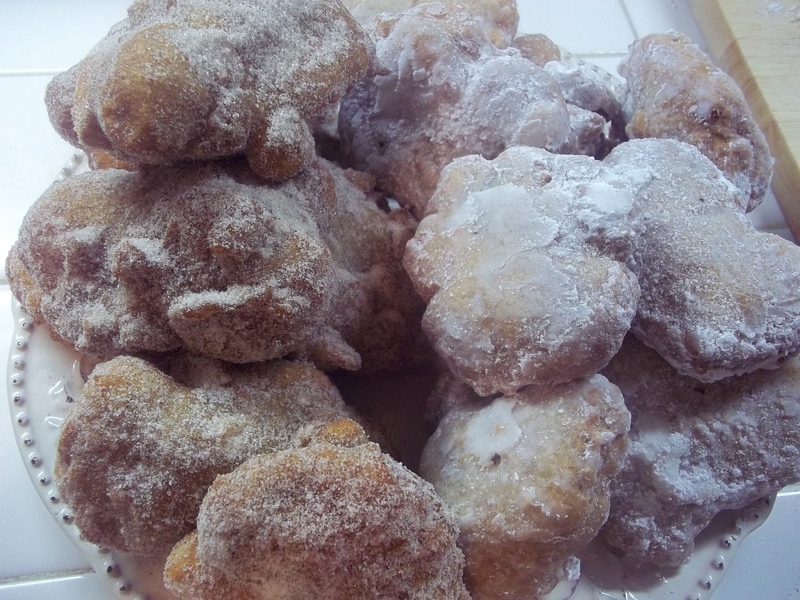 Yeah, I decided when I was categorizing this that I want apple fritters…and my mama. I can’t have either. Still wheat free and Mom’s in Germany for my cousin’s wedding. Have a good time with your family and fritters!